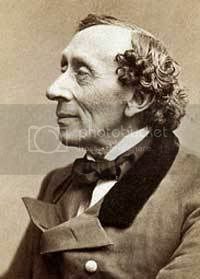 A caricature of Danish fairytale writer, Hans Christian Andersen. This was done for Danish artist Kim Larsen's online gallery of the writer, which features interpretations by many artists. You'd think someone with so many caricaturable features would be a walk in the park to draw. One false start, three trashed drawings and eight or so abandoned roughs later, I came to the final version above. Here, you can see the only other version which got past the rough stage, but to me it turned out looking more like an American Indian elder. The problem I found was that you have all these prominent features- the nose, the skull-like forehead, sunken eyes, bad posture and so on. If you decide to exaggerate all these traits they tend to cancel each other out and you're left with a fairly mundane caricature. 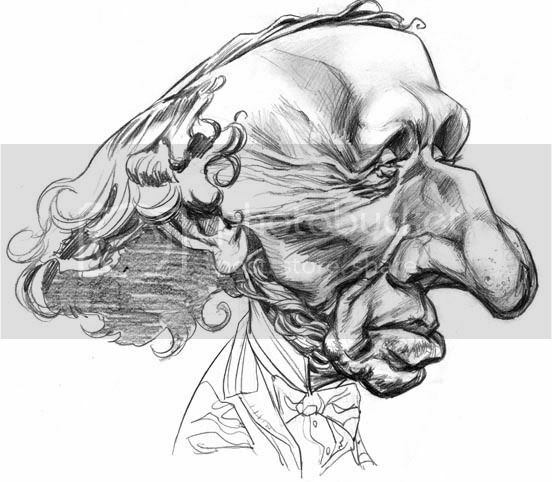 But the good thing about all the false starts was with each drawing I became more and more familiar with his features and was able to push the caricature further each time. I don't think I could have gotten to the final drawing above on a first attempt. On a different but similar note, I was in Denmark last year for the 200th anniversary of H.C. Andersen's birth, and here are a few little happy snaps from the trip. 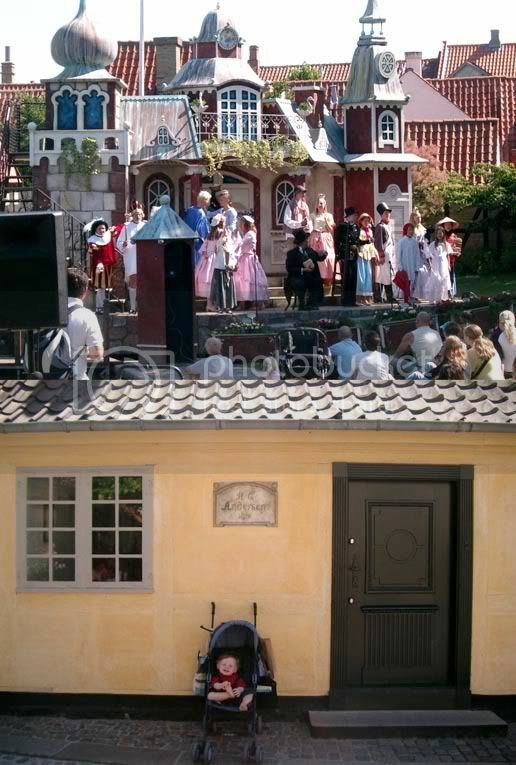 The first was from a play about all his fairytales put on in his hometown of Odense, the second is my son Alex in front of Andersen's childhood home. Chris this is really cool man, great job! I'm also glad to read that you're human too, that you don't get it perfect every single time, and that there's a thought process when doing this kind of work. I'm truly inspired! Chris, nice to see an update from you. 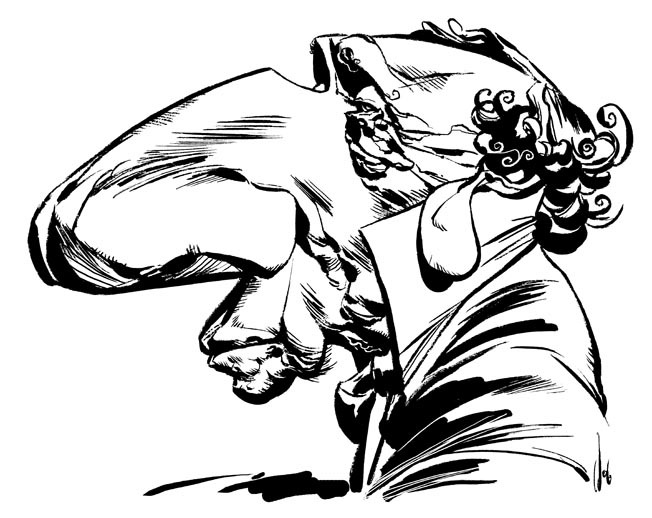 I been trying to learn more about caricatures, and visiting your blog from time to time makes me wanna draw more. also, I got a quesiton for your cwfaq. how do you go about designing a character? Hey Chris.... good job on the drawing... I really like the hair... great style to it.... PEACE! Really love all your caricatures, Chris, and this one is no exception! Never been to Denmark myself, but the holiday snaps looks cool, too. Lovely, as always. Your pencil art just knocks me out. I wish I had more intelligent analysis but sometimes a dumbstruck "Awesome" has to suffice. I've been admiring your caricatures for a while and your talent is amaizing. Can i ask you for the medium for this one? The changing thin/bold lines are superb. Too much visual goodness in this piece that it's difficult to know what to comment on. I like this cleaner version. Heri- I recently did a job for Pepsi which involved some character design. Once their campaign is well under way, I'll seek their permission to post them here on the blog, along with all the roughs and development sketches to give you some idea of what's involved. roberto- This piece was a inked with a brushpen, scanned in and then some addition inkwork and touching up was done in Photoshop. For example, all the white on black linework was done in Photoshop. Ingrid- Thanks hon. Luckily Alex got his mum's good looks. Gotta comment on this too. Beautiful drawing and incredible inking! Man, there's no stopping you!